Summary: Tara Westover was seventeen the first time she set foot in a classroom. Born to survivalists in the mountains of Idaho, she prepared for the end of the world by stockpiling home-canned peaches and sleeping with her "head for the hills" bag. In the summer she stewed herbs for her mother, a midwife and healer, and in the winter she salvaged metal in her father's junkyard. Her father distrusted the medical establishment and so Tara never saw a doctor or nurse. Gashes and concussions, even burns from explosions, were all treated at home with herbalism. The family was so isolated from mainstream society that there was no one to ensure the children received an education and no one to intervene when an older brother became violent. When another brother got himself into college and came back with the news of the world beyond the mountain, Tara decided to try a new kind of life. She taught herself enough mathematics, grammar, and science to take the ACT and was admitted to Brigham Young University. There, she studied psychology, politics, philosophy, and history, learning for the first time about pivotal world events like the Holocaust and the Civil Rights Movement. Her quest for knowledge transformed her, taking her over oceans and across continents, to Harvard and to Cambridge University. Only then would she wonder if she'd traveled to far, if there was still a way home. My Review: You guys. I can't even. I just. Wow! I haven't read a book like this one in a very long time. If. Ever. Thus, I am reduced to communicating in sentence fragments. My desire to adequately articulate my thoughts about what I've just read is overwhelming. I will try. I really want to get this right but will probably fall short. Because. Holy. Cow. 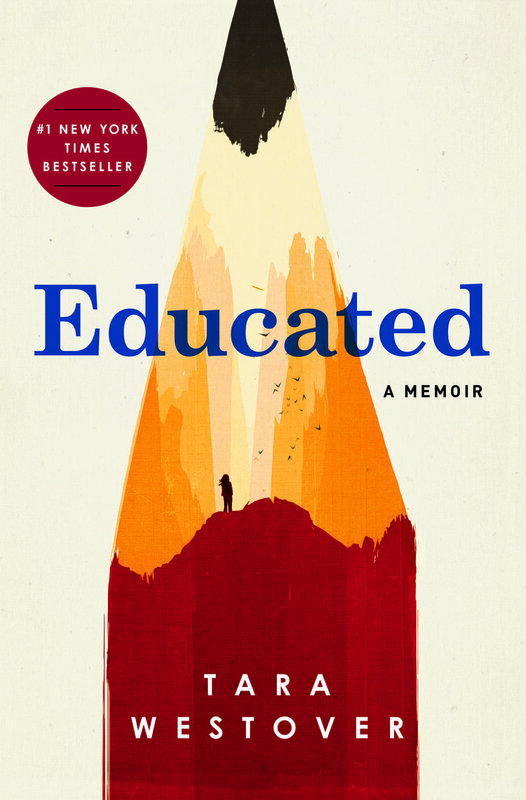 Educated tells the intensely riveting story of a young girl raised in an oppressively fundamentalist household (see disclaimer), and her struggle for survival, self-expression, and transformation. I didn't want to put it down. I did, because I had to feed my kids and drive them places, but it was never far from my mind or my fingertips. In the quiet moments I managed to carve out for myself, I devoured it, and when I wasn't reading it, I was raving about it to my husband, children, and friends (basically, anyone who felt even remotely obligated to listen to me). Though I have finished reading it, I am by no means finished with it. I feel a decidedly large measure of guilt when I say that I love this book. I'm not sure that love is really the right word for something so awful. I feel consumed by it. Chewed up and spit out. Forever altered by the experience. To say that her family issues were complex and deeply troubling, would be a massive understatement. Her trials were painful, confusing, and destructive, yet they were also formative and instructive. The only comfort I find in the horror of her experience, is that either in spite of it or because of it, a thoughtful, passionate, educated woman clawed her way out of the muck. It was strangely inspiring. If she can do what she did, with that childhood, then I have no excuses. Westover is an phenomenal writer -- and not in the relative-to-what-she-has-been-through sense, though no one can deny that her achievements in that regard are truly impressive. She's just a flat out amazing writer that effortlessly draws you into her history. I felt like a silent bystander in her life and was often flush with fear, anger, and sadness on her behalf, my heart pounding wildly in my chest or aching as hers must have been. I was impressed at her intentional evaluation of her own perspective, and that she consulted other members of her family in an effort to give the most accurate account possible, even adding footnotes where accounts differ. As with real life, I couldn't predict what would happen next and was constantly surprised, knocked back on my heels and reeling. Even days later, I still feel a ghost of adrenaline coursing through me when I try to talk about this book. I was incredibly moved by the people who served as anchors in Tara's life: her brother Tyler, who encouraged her desire to leave and learn; her college bishop, who listened; her BYU professor, and his determination to help her see her own worth; her Cambridge adviser, who saw her potential and found a way; the roommates, who stayed and helped when they might justifiably been scared away; and the siblings and extended family members who didn't abandon her. I can only imagine what her life might have been like without them. I say this not to take away any measure of the author's own achievement, but simply to highlight the invaluable nature of being active participants in the human experience and reaching out to those who seem ready to pack it in. "Tyler stood to go. "There's a world out there, Tara," he said. "And it will look a lot different once Dad is no longer whispering his view of it in your ear."" "I'd always known that my father believed in a different God. As a child, I'd been aware that although my family attended the same church as everyone in our town, our religion was not the same." "Not knowing for certain, but refusing to give way to those who claim certainty, was a privilege I had never allowed myself. My life was narrated for me by others. Their voices were forceful, emphatic, absolute. It never occurred to me that my voice might be as strong as theirs." "I'd come to BYU to study music, so that one day I could direct a church choir. But that semester-- the fall of my junior year -- I didn't enroll in a single music course. I couldn't have explained why I dropped advanced music theory in favor of geography and comparative politics, or gave up sight-singing to take History of the Jews. But when I'd seen those courses in the catalog, and read their titles aloud, I had felt something infinite, and I wanted a taste of that infinity." "A gust of wind swept over the parapet and Dr. Kerry teetered, clutching the wall. I stepped up onto the ridge so he could flatten himself against the buttress. He stared at me, waiting for an explanation. "I've roofed my share of hay sheds, " I said finally. "So your legs are stronger? Is that why you can stand in this wind?" "I can stand in this wind, because I'm not trying to stand in it," I said. "The wind is just wind. You could withstand these gust on the ground, so you can withstand them in the air. There is no difference. Except the difference you make in your head."" "I knew what it was to have a misconception corrected -- a misconception of such magnitude that shifting it shifted the world." "You are not fool's gold, shining only under a particular light. Whomever you become, whatever you make yourself into, that is who you always were. It was always in you. Not in Cambridge. In you. You are gold. And returning to BYU, or even to that mountain you came from, will not change who you are. It may change how others see you, it may even change how you see yourself -- even gold appears dull in some lighting -- but that is the illusion. And it always was." Now, we're back to me. Just read it. It's stunning, gut-wrenching, and worth every second. DISCLAIMER: I am a practicing member of The Church of Jesus Christ of Latter Day Saints (aka Mormon, if you will). The author of this book was raised in an extremely fundamentalist Mormon household, and the "gospel" preached by her father bears little to no resemblance to the mainstream religion in which I was brought up. Indeed, if it weren't for some of the common vernacular and occasional mention of shared scripture or church history, I would never have imagined that the faith of her father and my own had sprung from the same roots. Those hoping for a book denouncing the Mormon faith will not find it. Those hoping for a book singing its praises will leave unsatisfied. It is, as the author states at the very beginning of her book, "..not about Mormonism. Neither is it about any other form of religious belief. In it there are many types of people, some believers, some not; some kind, some not." Personally, I felt that the author was fair and accurate in any discussion of the mainstream Mormon faith. My Rating: 5 Shiny Gold Stars. Seriously.